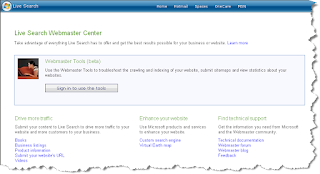 In order to set up Live Search Webmaster Center, you will need to have an MSN account (ie hotmail account). You can submit a website address to Live Search to include in the Live Search index. Generally, if you follow their guidelines, you don't need to submit your URL to Live Search for MSNBot to find the site. However, if you search for your page URLs and your site does not appear in the Live Search results, you can submit your site to them. Submitting your site doesn't guarantee that your site will be indexed, but it does help them locate your site so that MSNBot can try to crawl it. MSNBot doesn't automatically crawl sub-pages on your website. If you want MSNBot to index other pages on your website, submit URLs for those pages. Site Summary – which includes website status, the last time your site was crawled by MSNbot, the number of pages indexed as well as your top 5 pages. Profile – this is similar to Google Webmaster Tools where you can identify the address of your XML sitemap and have the verification option of using an XML file or adding at meta tag to your home page.. you can also specify the email address of your Webmaster. Keywords – allows you to review how this page performs in search results against specific keywords. By entering in a key phrase, you can see your top pages pertaining to that key phrase. Top Links From – examines your website’s outbound links (from your site). Communicates the 10 links that are performing the best in Live Search having received links from your site. Top Links to - examines the Top 10 pages on your site that are experiencing the greatest success in terms of external links. Sitemap – Allows you to provide the web address for your sitemap (sitemap being your XML version not your hmtl version although it appears that you can add that as well). There is still a few bugs with the product, but I guess something is better than nothing. This product still does not touch Google Webmaster Tools but at least it's a start.